Looking at a dongle’s output using fl2k_fm I spotted sideband signals at both sides of the produced carrier at 1.2MHz distance. It turns out that they occur as power supply noise created by the KB3426 switching mode buck regulators that power both 1.2V and 3.3 V power input lines of the FL2000 chip in several available implementations. A rather crude mod that includes the removal of the switching mode regulators and their replacement with 2 LM317 (TO220 package) linear regulators cleaned up the mess. And yes I somehow managed to fit them both inside the plastic box, thanks to the miniscule consumption of the chip there are no heat accumulation problems I guess there’s a more elegant way to install linear regulators in there, or someone could be blessed with having an implementation that uses linear reg from the start. In any case, if you open your FL2K case and spot coils in the power section (not the L at the RGB output, visibly spotted coils) expect a (rectifiable if you have mastered a soldering iron) dirty signal. 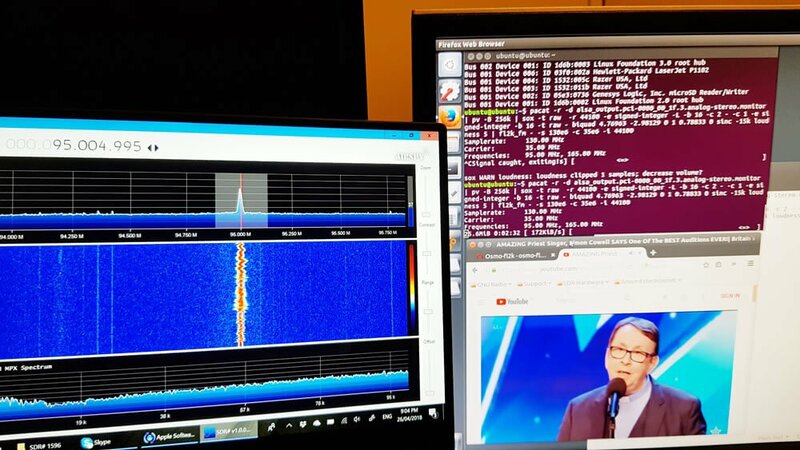 It is possible to make bts to transmit via fl2k and receive using rtl sdr on 900Mhz ? I cannot get around this error… i installed libusb already.. onyone got the same error message? Did you also install the -dev files for libusb ? The problem consists.. i use linux mint. When i try to install on lubuntu it works right away. Dont know why that is. Has any one been able to get WSPR on HF to work? Is it possible for RPi? No, it isn’t, because you need at least USB3.0 in order to do this. On RPi you could use square wave rpitx (a capacitor and 3-stage LC bandpass filter should be enough before a LNA), or buy a Pine64 or a ODROID XU-4 – two cheapest USB3.0 SBCs. I wonder… Can we transmit three independent signals by using G and B channels of the VGA as well? On paper you should be able to, but a computer with enough processioning power to do useful DSP in real time for three antennas will not be cheap. Maybe you could pre-computed everything offline, and streamed the raw bits from a SATA-3 SSD to the USB 3 port. I suppose it depends on what exactly you are trying to do. It’s pretty impressive the amazing work around to make a cheap tx sdr device! 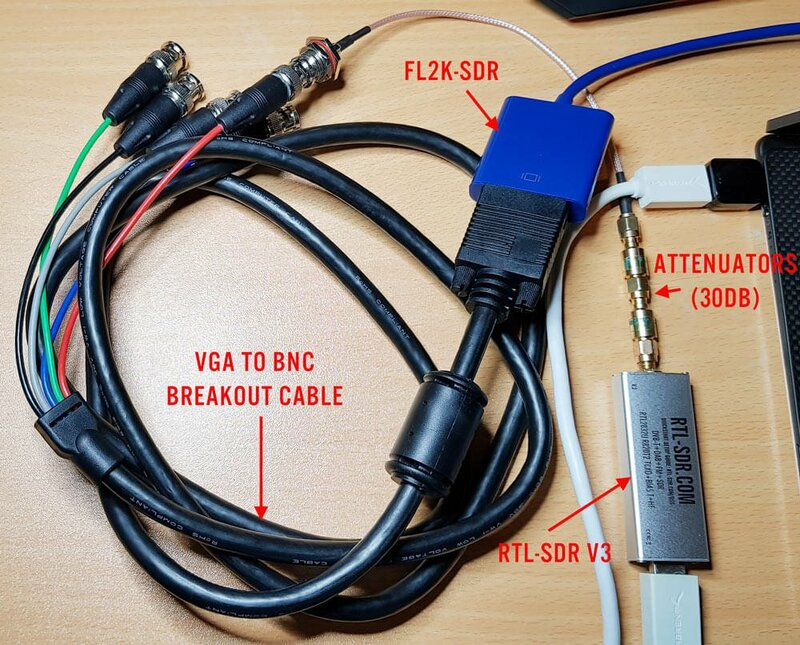 Yes, the colors on the breakout cable match the diagram. Dose this have the same output power as hackrf? Nope. This is just a DAC. If you want to have something like HackRF, you should connect it like that: FL2K -> bandpass filter -> RF amplifier -> antenna. Is there any budget solution for that? You can build the bandpass with very cheap components: Some ceramic capacitors and some coils made from enamelled copper wire. There are several calculators online where you can get the component values for the specified frequencies. Low noise amplifiers are on sale for around 5€ on Aliexpress, just select the one that works for your purpose. Antennas can also be build with some wire, there are tons of designs you can find for different frequency ranges. You should also have some coax to connect the things together. Easy to say but a bit more complex to build. Just the filter calculator will not bring you there. You need some kind of network analyzer to measure and tune the S11. If your S11 is not good your “cheap LNA” may run into oscillations if the design is not unconditionally stable. Another problem is that the “cheap LNA” may produce a lot of IMD products in-band and out-band due to a bad design. 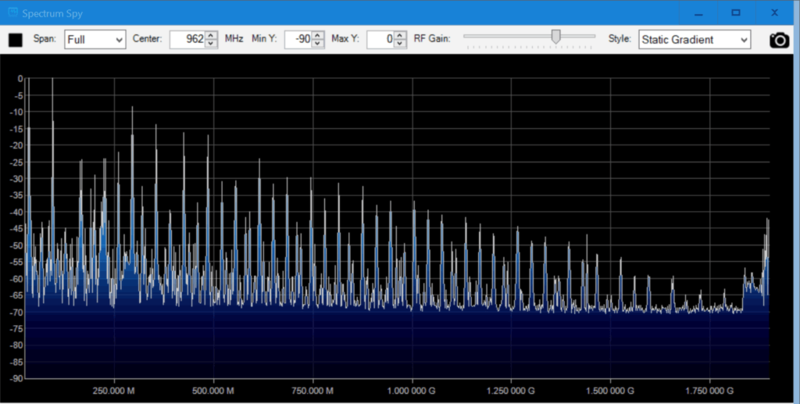 Have seen a lot of that in my spectrum analyzer. And the last problem is the antenna. If you can not tune the antenna S11, again your LNA may run into oscillations if the design is not unconditionally stable. So there are many factors if you want to comply with the local regulations. Using a cheap LNA on the RX side is not a big problem, you can spoil just your reception, but using the same cheap LNA on the TX, you may cause a lot of trouble without even knowing that. Any chance RTL-SDR might re-package and sell these? I know I’d be interested! Any chance of showing “cpufreq-info” and “htop” to give some indication of how much CPU processing power is required for ~400MB/sec of raw data with a light DSP overhead. And maybe the same with the device connected to a USB 2.0 slot at ~40MB/sec. FM would probably be the at the lightest end of DSP loads and would give a good indication of what the minimum requirements would be. I added some screenshots at the end of the post showing CPU usage. It is quite CPU intensive especially when higher sample rates are used. The test PC has a relatively fast i7-6700 CPU. Thank you very much, it gives a better idea of the resources used. FYI: The reason I asked for “cpufreq-info” is because there can be one a number of different CPU frequency governors active which actually adjust the CPU clock frequency up and down depending on how intensive the workload. Like if the machine is idle the CPU’s could be under clocked all the way down to say 50MHz to use minimal power and under extreme load it can, in the case of a i7-6700, overclock all 4 cores (2 physical x 2 logical) to 4 GHz. I suppose what I am saying is that the CPU load in htop can actually be less at a higher load than a lower load because the frequency of the CPU could have been increased! Which is confusing as hell, but can reduce your power bill. 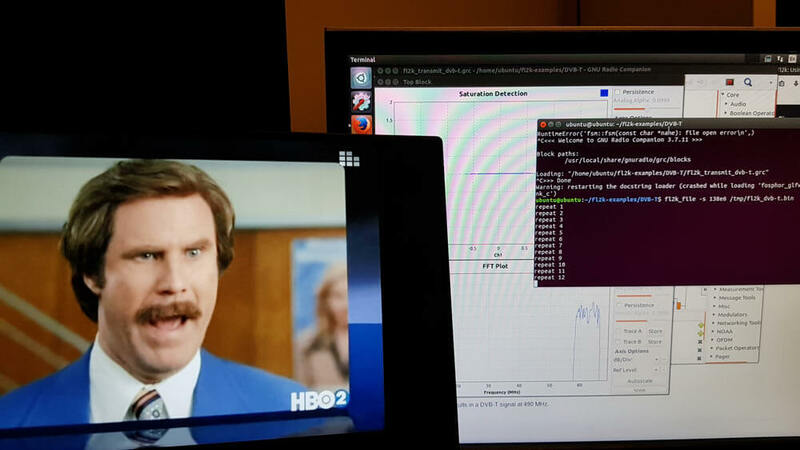 One way to force htop to show consistent results is to change the governor for the duration of the tests to maximum performance, maximum power usage and maximum fans . e.g. And then when the tests are finished, set the governor back to something more sensible, or take note of what it was before and return it to that. Any governor where less power is used and the fan is not running constantly. A reboot will also reset the governor back to whatever the system default is configured to be. Oh and there is a “powersave” governor which can sometime be handy if running from battery. But like I said it is FYI, I’m not asking you to do anything else. Well, better use LXC instead of full virtualisation. Also, I would rather need a programable band filter (we can use integrated I2C and amplifier solution than a loop-cable test. Even if you don’t have a ham radio operator license, there are many bands you can transmit without a license – CB, ISM, PMR etc. Licence free means the equipment has to be certified and approved by the regulatory body which is usually the government (unless you are military this applies to you). You cannot DIY a transmitter on CB, ISM, PMR and transmit it in the air legally without getting the equipment approved by the government, even they do not need you to have a persona licence. Amateur radio equipment does not require regulatory approval if you have the advanced level of licensing for you to use, such as DIY equipment. There are very low power exemption for this of course and it depends on which country you reside in. But CB, ISM, PMR are not one of those “very low power” assigned spectrum. Typo “Note that when broadcasting at 95 MHz (sample rate 100 MHz, carrier 35 MHz)” should read “Note that when broadcasting at 95 MHz (sample rate 130 MHz, carrier 35 MHz)”. It’s incredibly impressive what dedicated people can do. The total price would be comparable to RPi though (and you can run stuff right on RPi, no need for another computer). My understanding (also) is that for RPiTX you will primarily need a low pass filter rather than a bandpass filter (an LPF is slightly easier to make). Please correct me if I am wrong; never actually used RPITX. I haven’t used the RPi transmit capability either, so I don’t know what it’s maximum fundamental frequency is. But if you’re going to rely on a harmonic of the fundamental (for example, using the third harmonic of a 33.33 MHz signal to transmit at 100 MHz) you’re going to want to use a bandpass filter. If the Pi’s output signal is already on the desired frequency, then you can get by with a lowpass filter.